The AIGA Austin Changemaker Series is excited to announce its 2018 Changemaker Organizations: Foundation for the Homeless, LifeWorks Austin and Texas Appleseed. With our inaugural ATX Changemaker Series challenge focusing on “How we might better serve the homeless population in the Austin area,” we set out to partner with these inspiring nonprofits and change organizations that serve the homeless and seek to end this cause within the near future. Before the Change Organizations join us at our Weekend Workshop on June 9th, and collaborate with teams of creative professionals on a three month project to help advance their missions, we wanted to get to know them a bit more. Foundation for the homeless is an organization that promotes social and economic justice for all Texans by leveraging the skills and resources of volunteer lawyers and other professionals to identify practical solutions to difficult, systemic problems. Foundation for the homeless has a vision to be a community leader empowering Central Texans to fight hunger, homelessness and poverty. Their mission is to continue to mobilize faith-based and community resources in a spirit of compassion to restore hope and alleviate homelessness. Foundation for the Homeless seeks to alleviate homelessness in the Austin area, especially for families. Right now, what’s the biggest hurdle in the way of your mission? What are your biggest frustrations? We have a history of working closely with faith communities in supporting families experiencing homelessness. Recent programmatic changes have challenged us to creatively connect faith volunteers and resources to families in need, while keeping client confidentiality and dignity at the forefront of our programs. What do you wish the public knew about your work, your cause or about the people you serve? Foundation for the Homeless provides services that help our clients reach their potential, so they can fully contribute to our community and make Austin a great city for all of us. How do you overcome the many myths and misconceptions that exist about homelessness? We overcome myths and misconceptions that currently exist about homelessness by working towards reframing the story from focusing on the individual/family situation to focusing on how alleviating homelessness makes our community better for everyone. What’s the problem solving process like at your organization? How much room is there for creativity and out-of-the box thinking in your organization’s decision making? The current problem-solving process is usually free of structure. Being a smaller organization, we have the ability to implement changes quickly. Have you worked with designers before? If so, what was the overall experience like and is there anything you wish designers would do differently or you would do differently? We have not worked with designers in the past. If only one thing was to come out of this experience for the benefit of your organization, what would you want that to be? If only one thing was to come out of this experience for the benefit of FFH, we would want that to be exploring ways that we could use volunteers more effectively to support our mission. Now that you’ve been able to meet our inspiring nonprofit Change Organizations, be sure to keep an eye out for all the happenings and creative findings that come out of our Weekend Workshop! Have more questions about the AIGA Austin Changemaker Series? Email us at changemaker@austin.aiga.org. Following @AIGAAustin on social media or join our Changemaker Series email list to stay in the loop. 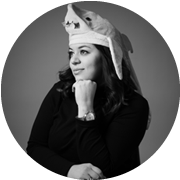 Christina E Rodriguez is a current 2018 MAIP Fellow working at Deutsch Inc. in Los Angeles as a UX Designer. In her spare time you can find her eating al pastor tacos while she obsesses over sharks.